I rummaged through my stash and came up with several options for cord and seed beads, as well as some Czech glass diamonds, lava beads, African recycled glass, painted Lucite and a circular slider. I decided to do some research on the Brandberg Massif to get some inspiration and what I found fascinated me. 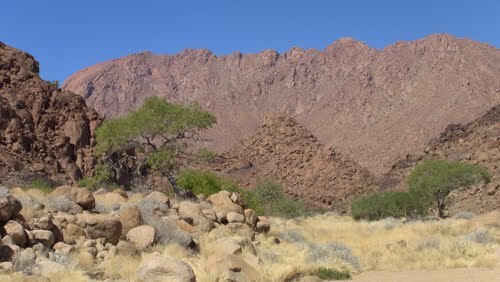 The Brandberg Massif is all that remains of an ancient volcano in the Namib Desert. It was once an active volcano until granite magma hardened and plugged the vent millions of years ago. Eventually everything around the granite eroded away and all that is left now is this circular protrusion rising over a mile high, towering over the desert below. Encompassing an area over 250 square miles, it is so tall that it actually affects the weather. It takes what moisture is in the clouds before the rains can reach the desert. It is a wild an inhospitable place, but it was not always so. Archaeological evidence suggests that people lived in this area, sheltered by the mountain. They drank from streams that are now dry, filling only on those rare occasions when rain swells the forgotten riverbeds and collects in small pools. They hunted in the valleys and they left behind pot fragments and spearheads that are now covered in earth, buried in time. They also left behind a huge collection of rock paintings that give us glimpses of their lives. The most famous of the Brandberg's paintings is The White Lady. The exact age of these prehistoric paintings is unknown, as is much about the figures represented. The White Lady was so named because of the central and most detailed figure - that of a human with white arms and white legs. Now thought to represent a hunting scene, the central figure is probably a medicine man with arms and legs painted or covered in some sort of decorative attachments. It's a tantalizing glimpse of a culture long since gone. I am fascinated with the people who came before us. They seem so different, so far away both in time and in distance, but in the end, we are all the same. We live, we breathe, we love. We raise our children and get by the best we can. But back on to the beads. I decided to use some glass seed beads with a Picasso finish - the grays and blacks all mottled together remind me of the rocky mountain. I chose chartreuse cord to represent the pockets of lush grasses that spring up when it rains. I used a pattern I've been developing, with circular portions that seem to mimic the round shape in NASA's photo. And I added a sterling silver charm that reminds me of the simple lines of the rock paintings and the relentless sun of the surrounding desert. I hope you've enjoyed this post and I hope that you'll take the time to visit the other participants! Great post! Thanks for letting us wanter through this prehistoric desert with you before showing us your personal interpretation. Love that you've used an artform also found in antiquity. The hardest part for me would have been choosing among those treasures you found in your stash. The picasso seed beads are perfect! Wow you really put your ALL in this challenge - BOTH?! and micromacrame too? I feel like a lazybones now. I LOVE the way you laid out your beads and components right on the palettes, those photos are INSPIRING! I love the second bracelet the best, lime and purple is one of my favorite color combos. REALLY nice job with this challenge Sherri! Awesome work as always, Sherri... I am drooling again over your precise little knots... so jealous! And the colours look amazing over the photos. Love your explanation of process - it is perfect the bracelet totally depicts your take on it all... I appreciate the history behind the inspiration as well - nice post - great works of art! Weren't the Challenge of Color palettes just beautiful? I was so happy with the ones I got. You made such a gorgeous piece with yours! You did a fantastic job on this challenge! I think all of the palettes were amazing. I am planning to work with a few more of them when I get the chance! Each element was just perfect in both bracelets, and they came together as just fabulous eye (and arm) candy! Those are both stunning! I always love to see your work and these are beady goodness to the max! I love the spread of beads for the second palette .. and your finished project .. wow! I am always impressed by your technique. You are the queen of the knots! The secon one is really terrific. These are museum quality pieces - I swear, you seed beaders amaze me every single time! I love your pics - especially the one with all of your beads and components on top of the inspriration piece. But your finished designs are so very, very lovely! I love you have done on both of your pieces. And I like how you researched the sites. Also like how you photographed your supplies with your color palette. Great post. Great job on both of your pieces. The lime green with dark gray is striking. I actually love both bracelets! Your beadwork is fantastic, and that green is so eye-catching. I love that both pull design elements right from the photos, from the lines of the first to the beaded clusters of the second - those remind me of the actual shape of the massif. My favorite is the Desert Patterns bracelet. WOW,wow,WOW!! Fantastic interpretation of the color palettes. Beautiful pieces. Both bracelets are just so beautiful...little knots and little beads...amazing! I'm partial to the lime green one. These are incredible! The colors are amazing. I love them both but the first one is just...wow. WOW! Just...wow! Your work is intricate and so beautiful...you are such an inspiration. I love both pieces so much, and after poking around your blog I have to say, I'm a fan. Thank you so much for sharing your art and your process! Sherri, your pieces are absolutely stunning! I am particualrly blown away by the micromacrame! I always wanted to learn macrame, but couldn't ever get the hang of tying my girl scout tie! I figured it was pointless for me to try, but your beautiful work makes me want to give it another go! Lime green is so not my color but after seeing your gorgeous bracelet I might have to change my tune. Simply stunning. What gorgeous beadwork in both pieces. I'm amazed at the beadwork. They both are great at capturing the colors in your palette, too. very nice.